100% of the donations collected from this DVD supports our Dana Distribution Program. 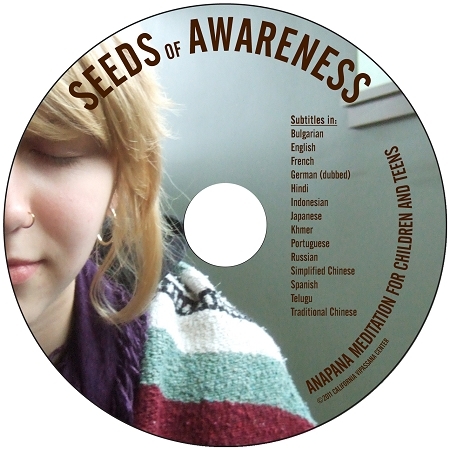 Seeds of Awareness documents modern children's experiences with Anapana meditation. This breath awareness technique dates back to the Buddha. Today it is available in short courses tailored for children and teens. The film outlines the course process and impact. In interviews, participants, parents and teachers talk of how Anapana helps in dealing with the pressures of school, family and social life, as well as the challenges and benefits - calmness, improved concentration and compassion. Bulgarian, English, French, Hindi, Indonesian, Japanese, Khmer, Portuguese, Russian, Simplified Chinese, Traditional Chinese Spanish and Telugu. Also available as downloadable and streaming video in multiple languages (subtitled). Exactly what I wanted. My daughter was asking me if I thought meditation might help focus the 2 grandchildren (boys 8 and 10) with school. So just maybe they may register for a course. For the teens of today it's an absolute must ! This is an excellent dvd about the Children / Teenager meditation courses.